Originally uploaded by John Lilly. i’m pretty sure i’m the last person in the world to decide that flickr is probably the best place to put my photos online. (better than hosting on my own server, better than any other galleries.) interface isn’t great for viewing (as opposed to organizing & tagging, which is pretty great, but it’s as good as anything i guess. 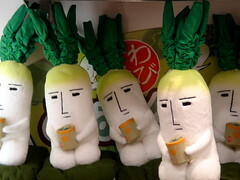 anyway, these are daikon radish plush dolls, a picture taken at kiddieland in tokyo last year. This entry was posted on Monday, February 12th, 2007 at 8:46 am	and is filed under Design, Weblogs. You can follow any comments to this entry through the RSS 2.0 feed. Both comments and pings are currently closed. I finally bit the Flickr bullet earlier this year when they made a “Pro” subscription unlimited. It’s not perfect, but for $25/yr it’s worth it just to never again have to upgrade self-hosted software.